Here you can find tips, tutorials and short examples about the database. 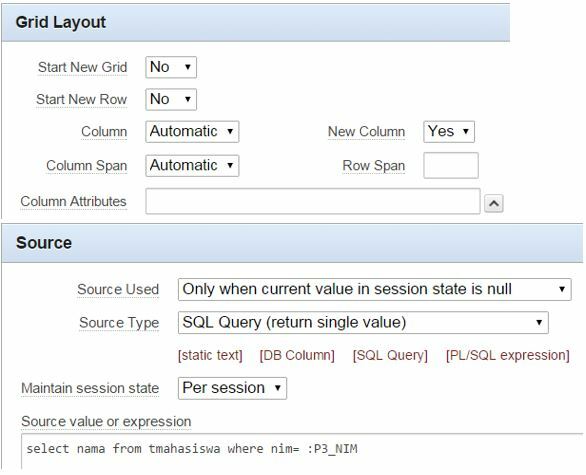 You will found many short examples of coding containing a ready-made database especially regarding the use of general SQL, Oracle PL/SQL and Oracle APEX. 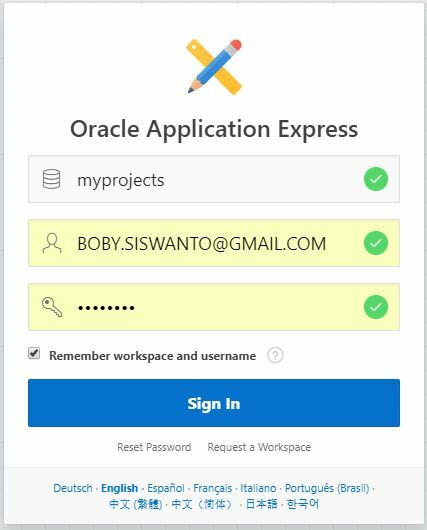 This article will describe about How To Create First Web Application in Oracle APEX (Application Express). 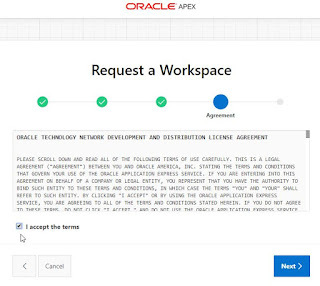 After successfully install Oracle APEX, the next process which is the main process is creating the web application. 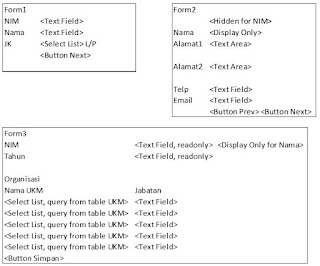 This article will give you an illustration about how to create simple web application. The processes will give you global knowledge about how to create a web application in Oracle APEX for all of your future applications. When you understand the processes in this article, you will be able to create other application easily. 1. 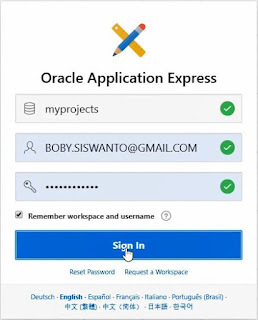 Login into your Oracle Application Express Workspace. 2. 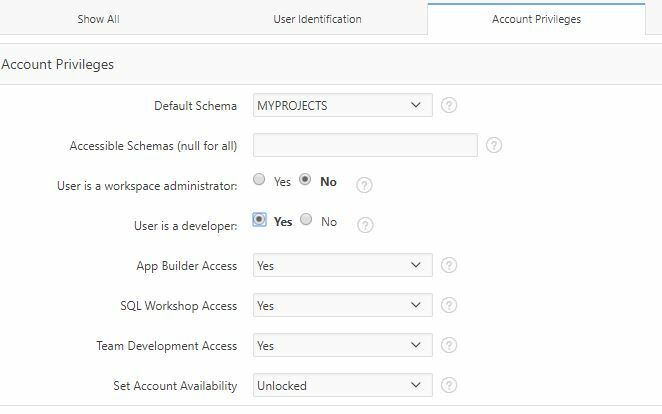 After successfully login into the workspace, click on App Builder to start the creation. 3. The next process is choosing about how we are going to create the application. 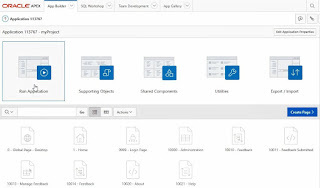 We can Import existing application by choosing Import icon instead of creating from scratch. 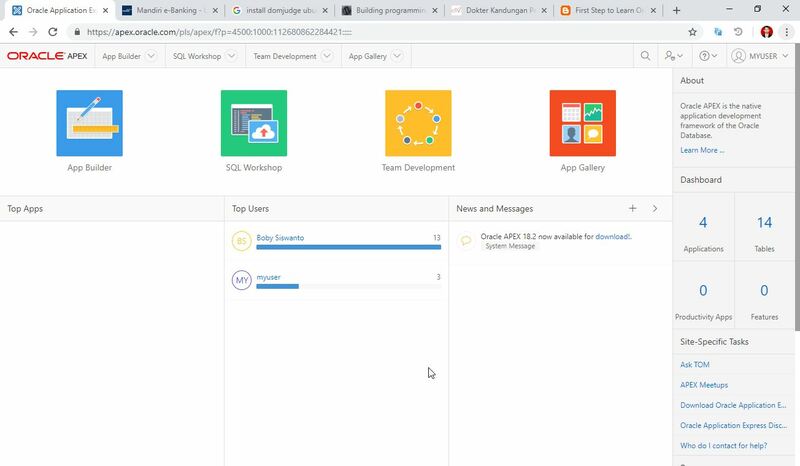 Here in this article we are going to create the application from scratch, so we choose Create icon. Scroll down the page and click on Create Application button on the bottom. 6. The creation progress bar will appear, wait until the progress is completed. 7. That’s it, we already complete the process, some pages will be generate automatically. It’s time to test our new application by clicking the Run Application icon. 8. 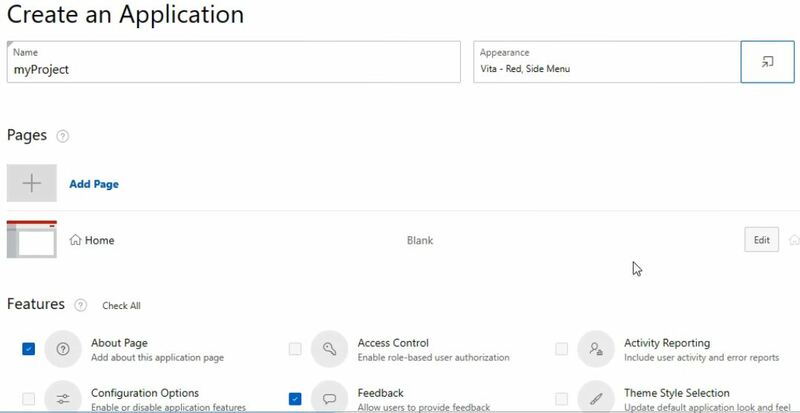 The first page will be shown is your application login page. 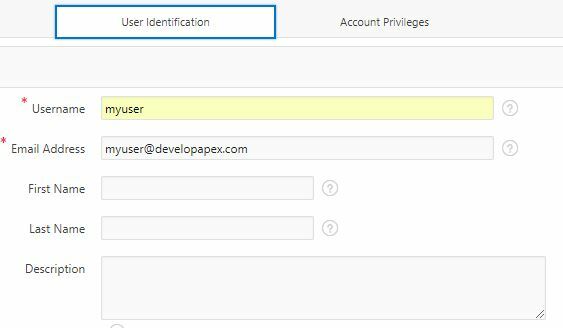 Fill your Oracle APEX credentials and click the Sign In button. 9. 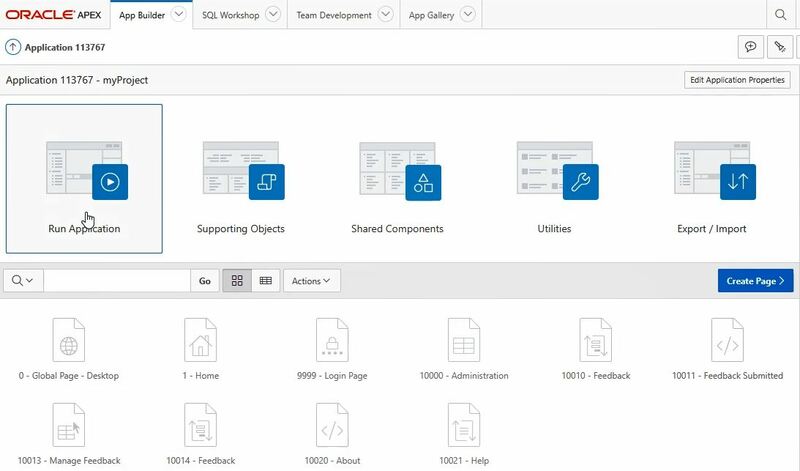 Your new application home page will appear, you may click anything visible there. If you want to sign out from your application just click on login username located on the right top of the page. 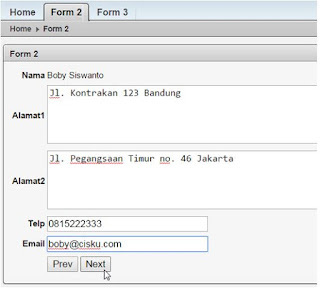 That’s all for the process of HowTo Create First Web Application in Oracle APEX. 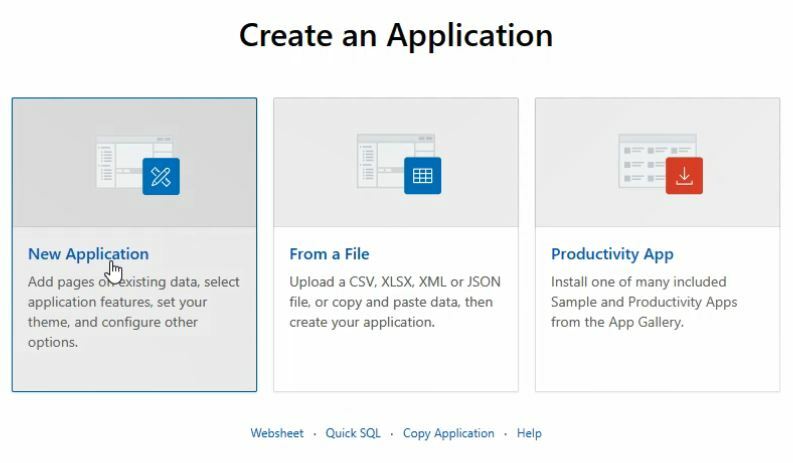 Hope it’s clear enough for you to create your first web application in Oracle APEX. This article will describe about How To Create Workspace User in Oracle APEX. You will get one workspace when you are successfully register on Oracle APEX website (https://apex.oracle.com). 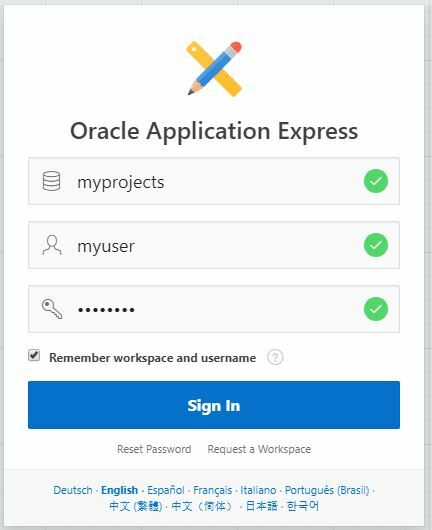 On Oracle Application Express, all of your applications and data will be combined on 1 application workspace. 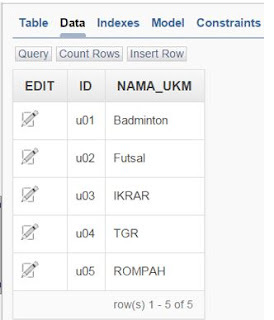 This workspace will have a correlation with your database schema. 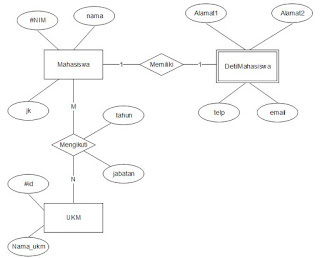 One workspace will be mapped into one schema, but one schema might be used by several workspace. Workspace can be analogically as a garage. On a garage there will be stored some tools, a vehicle or some furniture (chair, desk, etc.) or anything you want to place in it. Garage will be secured with a special door with a key. To enter the garage you must open the door with a correct key, without a correct key you will not be able to enter the garage. You may allow another person to enter the garage by giving the duplicate of the key. 2. Click on Manage Users and Groups option, it located on the right top of your Oracle APEX dashboard. Click on the head with dropdown menus (3rd from the right) and you will get the menu. 3. 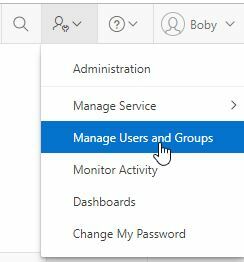 Now you will be at “Manage Users and Groups” page. You will find existing users there. 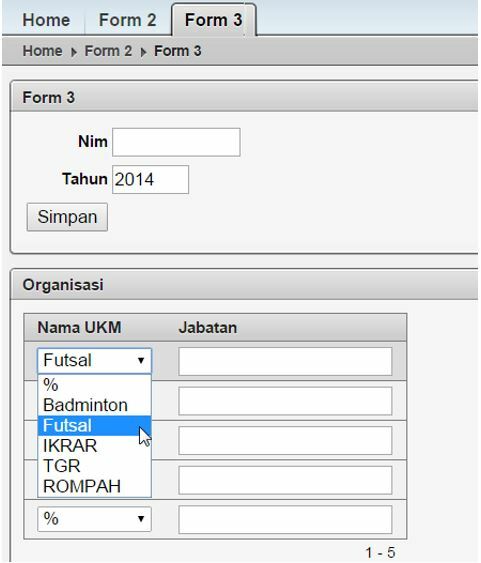 Click on Create User button (blue button) on the top right to start the process. 4. Next on User Identification section you need to fill some information. 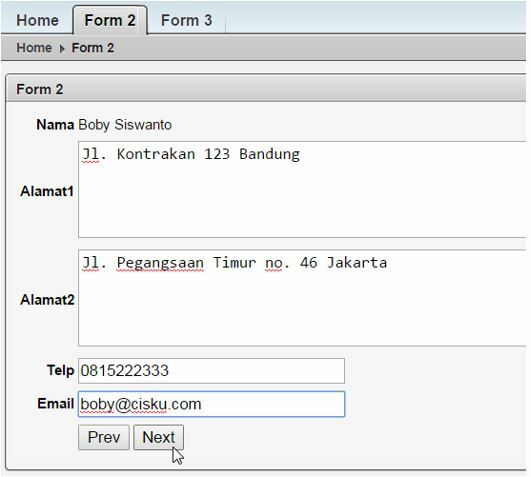 Fill the desired username and your valid email address, these fields are mandatory. 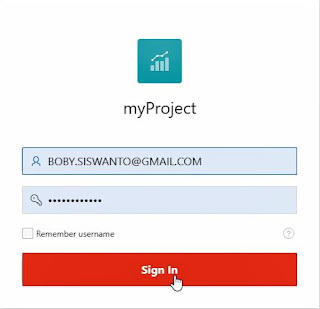 Next Click on Account Privileges tab. 5. 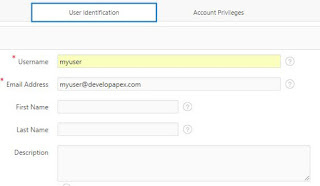 On Account Privileges section, you must choose some options. 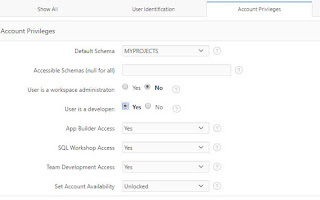 Choose the default Database Schema, decide whether the user is workspace administrator or not. The one thing for sure is you must choose the user as a developer to give the user access to be able to create some applications. Next click on the Password tab. 6. On the Password tab, set your desired password. 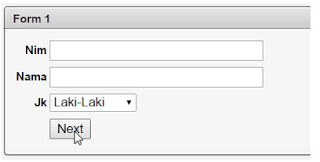 It must be unique password, consist of 8 character with combination of uppercase, lowercase, number and special character (e.g. *). Click on Create User blue button to complete the process. 7. Now you will find new user you just created. 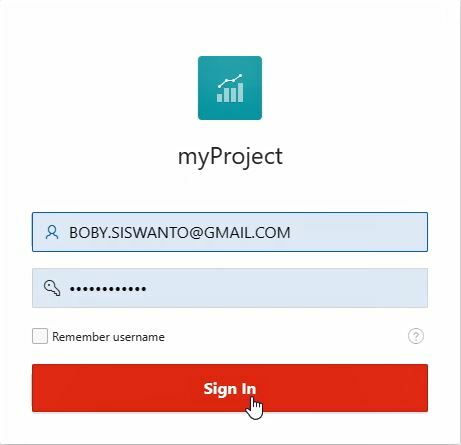 To create another user, you can repeat the process by clicking the Create User Button. 8. It’s time to check your new user. 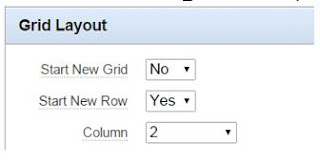 Sign out from existing user by clicking on Sign Out button under currently connected user (top right corner). 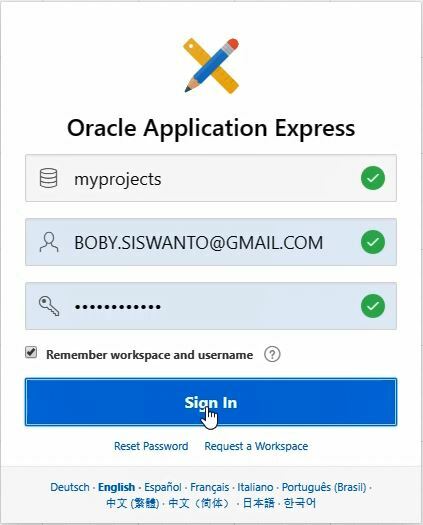 Sign In with your new user on the Oracle Application Express Sign In form. 9. 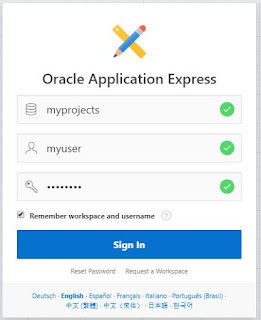 If you are entering the correct username and password combinations you should be able to enter the Oracle Application Express dashboard as a developer. 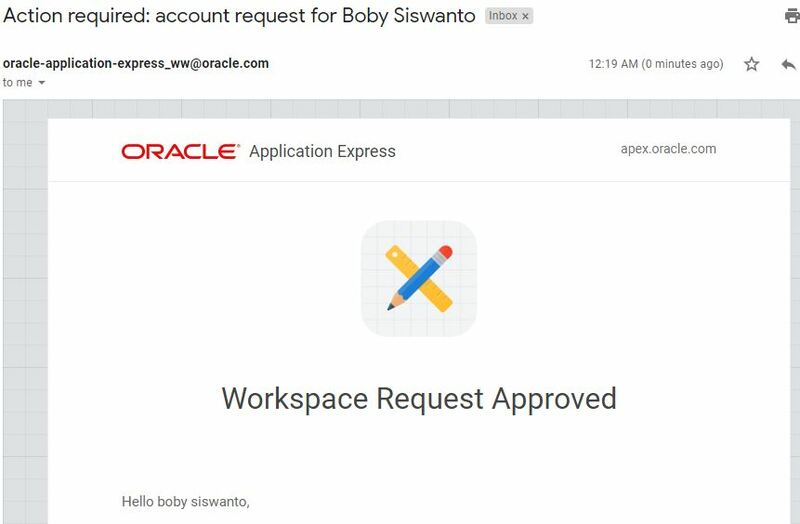 That’s all for the process of HowTo Create Workspace User in Oracle APEX. 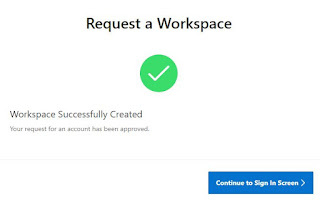 Hope it’s clear enough for you to manage your workspace users. 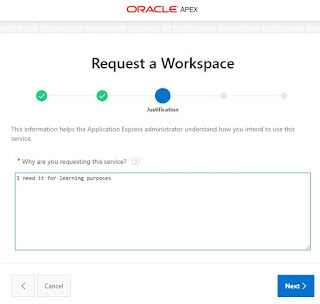 This article will describe about first step to learn Oracle APEX (Create a Workspace). Before you can develop any application with Oracle Application Express (APEX), you must have a workspace to deploy your application. 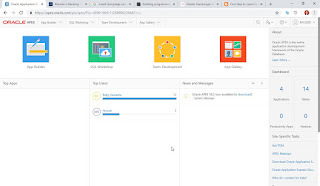 As we know that Oracle APEX is integrated with Oracle Database, every application develop with Oracle APEX, automatically will be stored in Oracle Database along with the application data. Oracle APEX is a free web-based development environment. 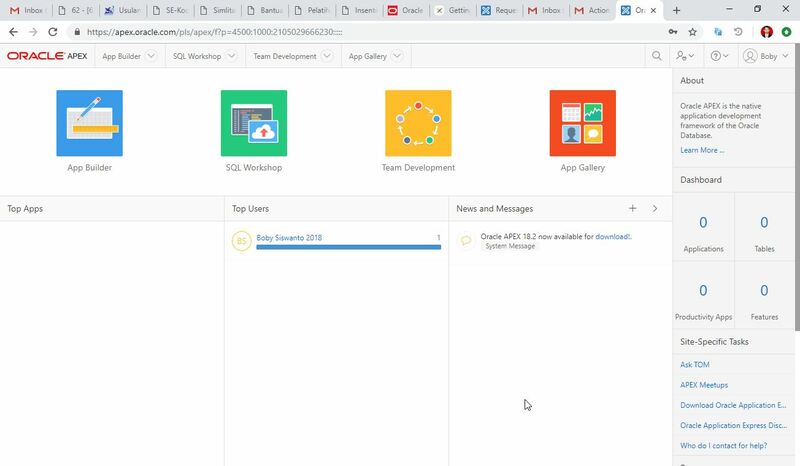 As long we have authentication credential to the Oracle APEX server, we can develop our application anywhere in the world using a web browser. 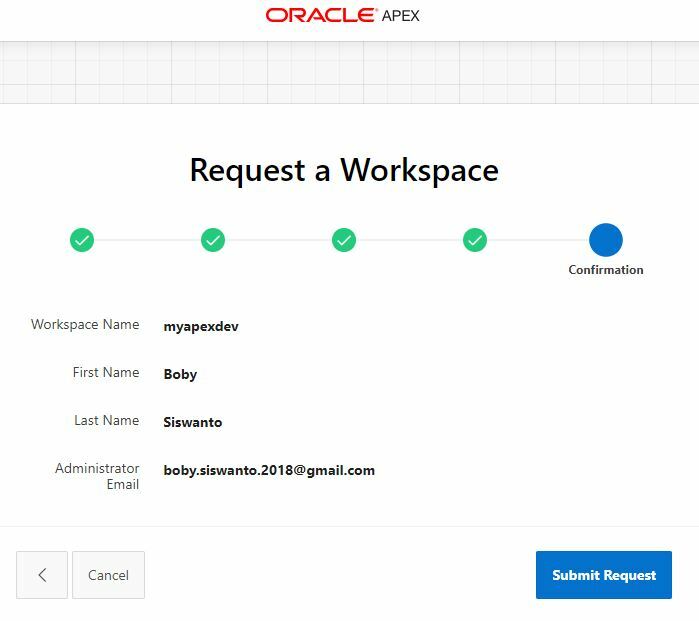 To obtain the workspace, we need to request the free request by accessing apex.oracle.com website. 3. We will find the Request a Workspace form. In the Identification section, fill your identity and your desire Workspace name. Click on Next button when you are done. 4. In the next form we will be asked to fill some survey questions. Answer the survey then click on Next button. 5. Next you must write something about why you are requesting the workspace. You may answer it by type “I need it for learning purposes” or something like that. Click on Next button when you’re done. 6. After your information recorded, next step is agreement confirmation. You have to click on I accept the terms (please scroll the terms and read it) then click on Next Button. 7. 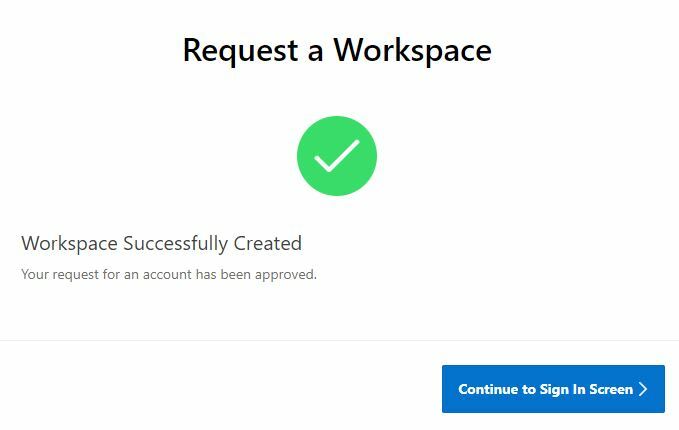 The final step of workspace request is reading the Confirmation page. Make sure the information shown is the same as your desire. Click in Submit Request Button to finalize the request. 8. 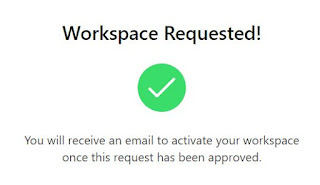 Notification will be shown, next you have to check you mailbox to activate the workspace. 9. 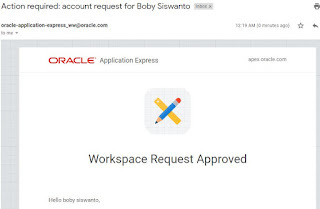 Open an email sent from oracle-application-express_ww@oracle.com, it will stated that you workspace request approved. 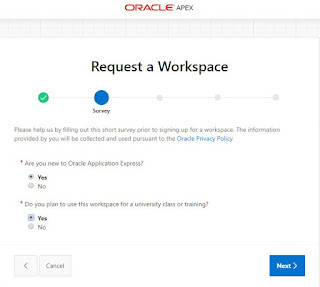 You have to click on the given link, it will be redirected to oracle apex website. 10. Congratulation! 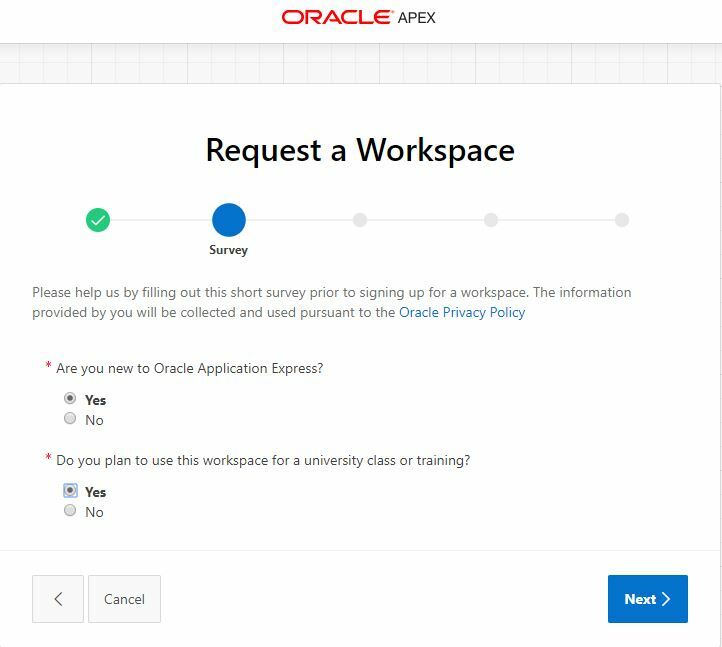 Your free Oracle APEX Workspace has successfully created. 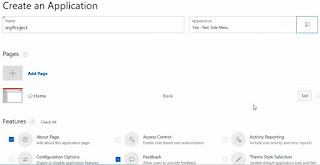 Click on Continue to Sign In Screen button to enter your workspace. 11. 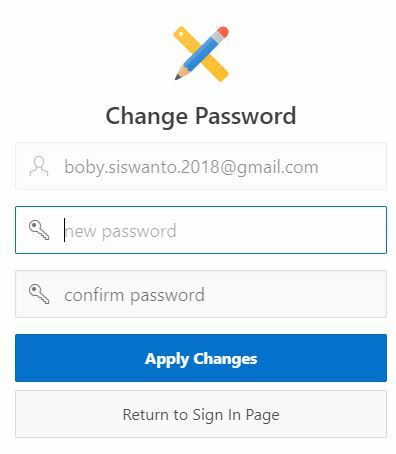 Because it is your first time to access the workspace, you need to change your initial password. Please enter your new password then click on Apply changes button. In the future this process will not be needed, you can change your password only when you need to change it. 12. 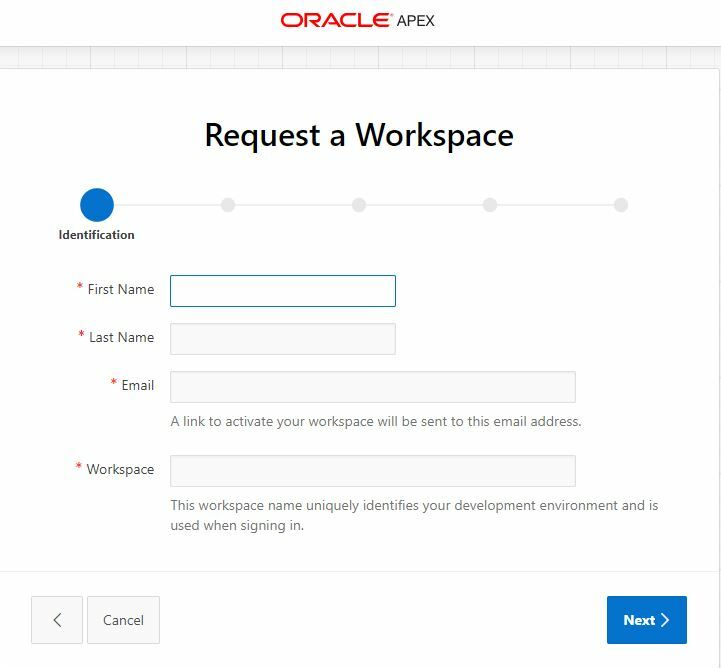 Here is your Oracle APEX Workspace desktop, now you can start to create your Oracle APEX application. 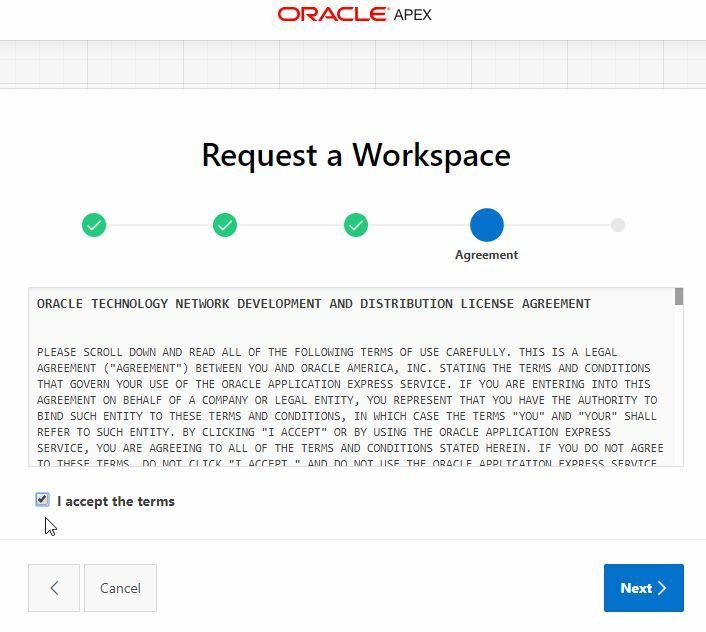 Okay that’s all the processes to create free Oracle APEX Workspace. This is the first step to learn Oracle APEX. 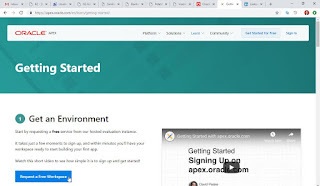 Current version of Oracle APEX is 18.1, here we are going to discuss about Oracle APEX 18.1 tutorial for beginners. So let's get started. 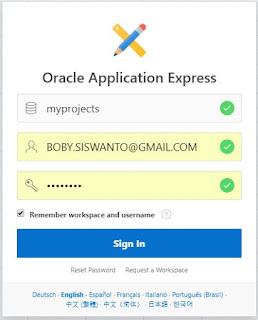 Oracle Application Express is a free development tool provided by Oracle. 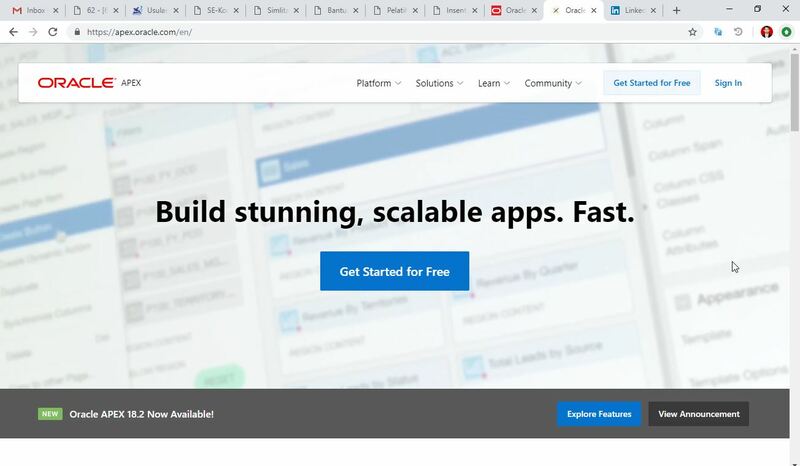 Why it called express because it allows developers to create web-based applications quickly only by using a web browser and stored data directly into Oracle database. 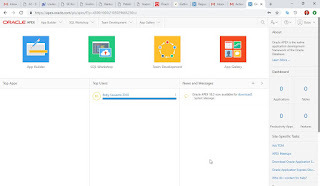 That's all for the new features available on Oracle APEX 18.1. 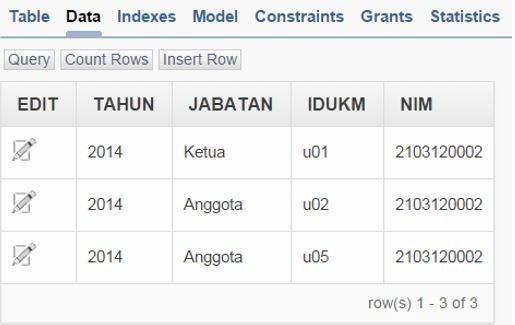 The INSERT command has a rule value (must be the value) must have the same number, data type and sequence with the attribute (column name) of the table to which it belongs. 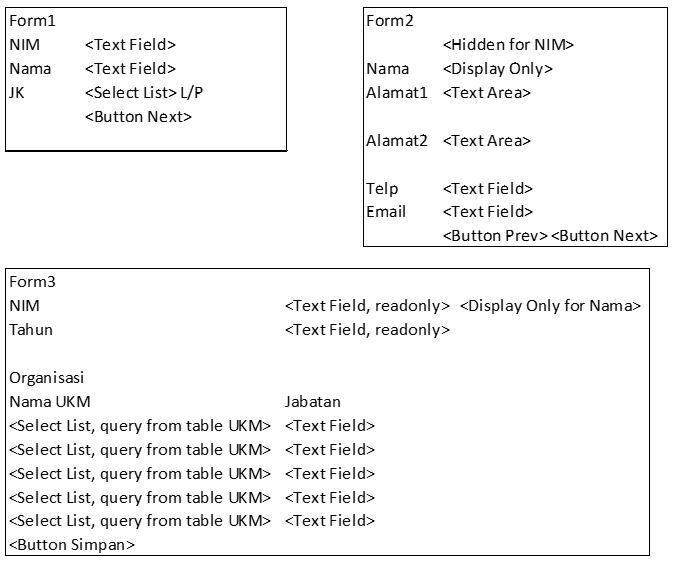 If the structure of the destination table is known for certain amount, data type and sequence then the column name / attribute can be excluded. 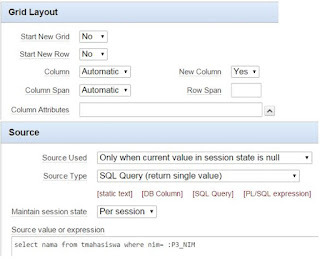 INSERT INTO tstudent -> Perform the insert command into the tstudent table. 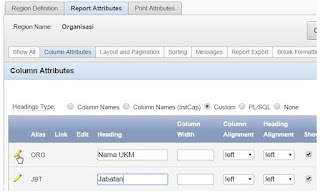 (sidm name, phone) -> Target attributes to do the addition of data, the order of attributes really need to be considered. 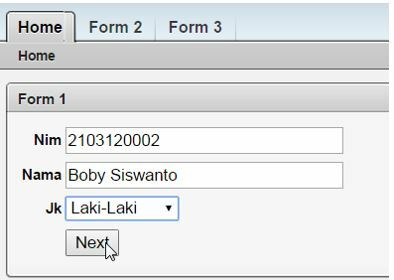 VALUES (101, ‘One’, 111111) -> The value 101 is inputted into the SID attribute, the value 'One' is inputted into the name attribute, the value '111111' is inputted into the phone attribute. These three values generate a new row of data in the table. 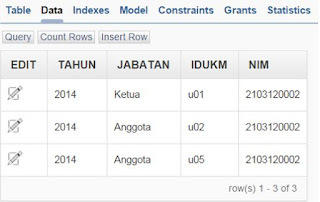 ; (titik koma) -> Denotes the end of a SQL command. Thus one uses the INSERT command on DML. Explanation of other INSERT commands and other DML commands will be discussed in the next article. 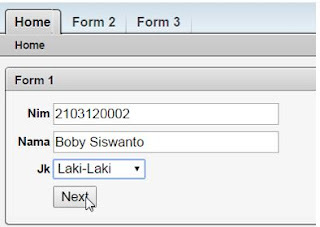 This article will discuss about advanced form development (nested form with tabs) on Oracle APEX. 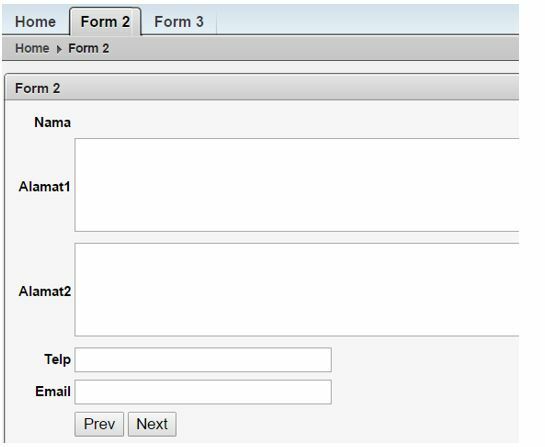 Here we’re going to create a process of submission that involves three forms where each form in on different tab. The goal is we will fill some data into form1 on tab1, after completed then we will fill some data into form2 on tab2 and then we will fill some data into form3 on tab3. Data will be correlated among all of those three forms. The development phases will be divided into three, that are ER Diagram creation, Mockup Diagram creation and then following with coding phase. 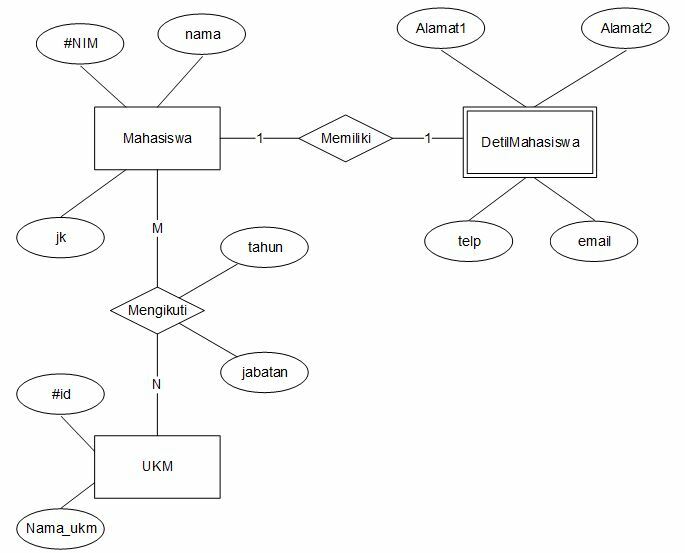 This article will use following ER Diagram that has 3 Entity Sets (Mahasiswa, DetilMahasiswa and UKM). b. Add a Next button, action when clicked is Submit. c. Finish the creation process the edit it. Add a HTML Region. c. Finish the page creation the edit it. Add new HTML region. 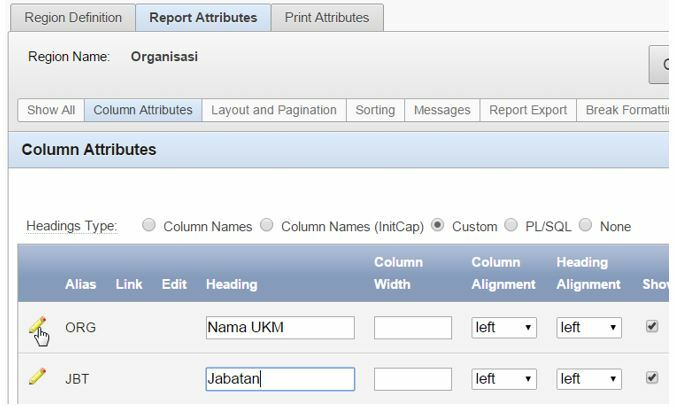 Edit column ORG and JBT, make sure the Column Attributes set to Display As Standard Report Column. Apply Changes. The creation process has completed, now we’re going to try it. 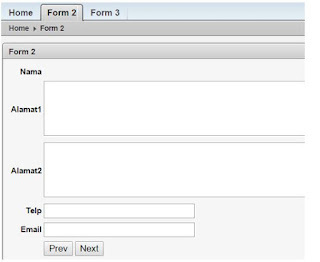 a. Form3 will automatically shows, fill the text fields. 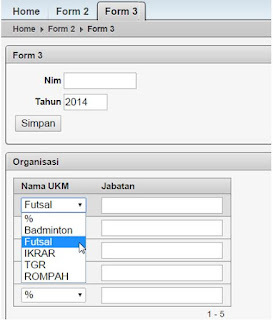 Choose select list options on bellow area (Organisasi) and fill the Jabatan’s values. Click Simpan button. 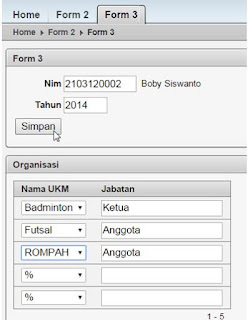 c. Check the TMAHASISWA table, new record with Boby Siswanto values will be inserted. 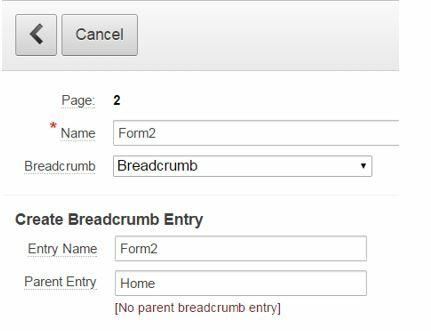 That’s all for advanced form development (nested form with tabs) on Oracle APEX tutorial. 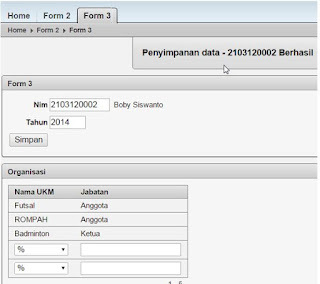 You should be able to create one process divided into several forms.